The Hackaday 10th anniversary was an awful lot of fun, and part of what made it awesome was all the cool things that the community brought to the event. We hadn’t really had a chance to get down to meet the guys from TwoBitCircus before now but they were more than happy to bring along their excellent Hexacade machine. The 6-player custom built arcade game that was an absolute blast! After the party TwoBitCircus’ fearless leaders [Brent Bushnell] and [Eric Gradman] invited us over to their space for a quick look at their workshop, and to give us a personal invite to the Hacker Preview day for their upcoming STEAM Carnival. No this isn’t Steam as in Steam-punk, but STEAM as in Science Technology Engineering Art and Mathematics. Their space is really quite amazing, part of The Brewery Art Colony near downton Los Angeles. 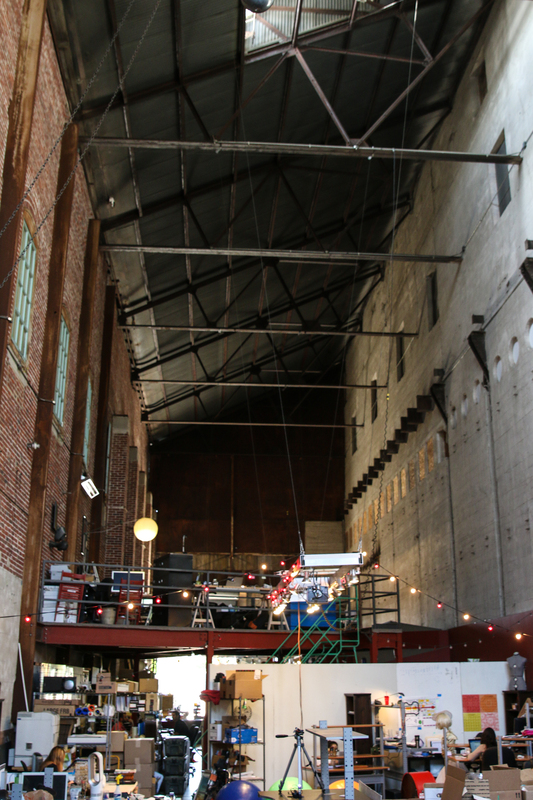 The building is actually an old steam power plant with incredibly high ceilings. The TwoBitCircus crew is now about 30 people all building interactive games and art pieces for events. They call themselves a digital circus and a lot of their work harkens back to old carnival games of yore with a new digital twist. [Eric] and [Brent] spared a few minutes to give us a quick run down of what sort of games to expect at the STEAM Carnival. There will be a wide array of entertainment: giant marble runs controlled by see-saws, whack-a-mole/twister mashups on huge glowing button walls, laser based foosball, and the more extreme immolation dunk tank! It will be a most entertaining and educational event. The main public days are on the weekend of 25th – 26th of October, but there is an invite only hacker preview for the local community on Thursday October 23rd which we will be attending. If you’d like to go to the main event, use the code HACKADAY for $5 off the ticket price of $25. What was most interesting about TwoBitCircus for me as a maker of things was how these guys have turned their hobby into a thriving events business. Brent tells us that they’ve been at this for 8 years now and the company has been around for 3. They’re doing pretty well too, making incredible things for some of the biggest companies around. This really is the best possible job for any inventive hacker sort, building crazy stuff all day for people to play with! I left the place feeling incredibly envious. Check out the photos below for some impression of the sort of craziness you might see at the carnival! Hanging above the entry to the TwoBitCircus workshop. An auto piano being modified to do something….? Marble maze, controlled by seesaw! Obviously the see-saw needs some work. Just 2 weeks to go and they’re still inventing new things! The mouth looks like its going to eat someone. Prius rims hacked together for effect! This little guy looks like something out of Doctor Who. The workshop is in full build mode. Now thats a hackers workstation! Keeping to the Carnival roots with a giant bear? What sort of workshop would it be without a lazer cutter? Another button based game in mid-build. Can I have giant shelves please? Is this a failure from the immolation dunk tank testing? I’m not sure I want to know wht they’re doing with this. Each Pi gets a router, a power supply and a hub. Thats a lot of pi.